Service-it Deep Clean Washing Machine Cleaner removes 99.9% of micro organisms and bacteria, leaving your washing machine hygienically clean and smelling fresh. 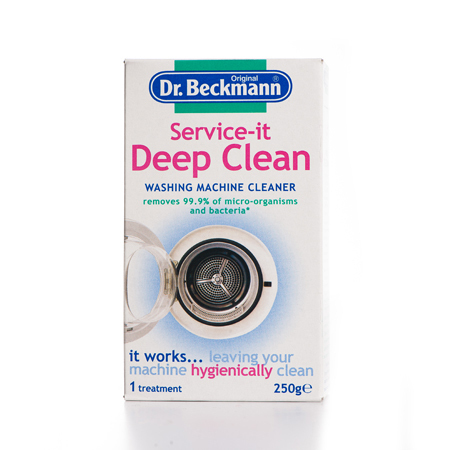 Use Dr. Beckmann’s specially formulated Deep Clean washing machine cleaner to tackle the dirt you can't see in your machine. Only a ‘Deep Cleaned’ washing machine can promise truly clean clothes. It should be used once every every 2 months or every 30 washes to ensure your machine is as clean as possible and continues to run smoothly and effectively. Dr. Beckmann Service-it washing machine cleaner cleans, freshens and maintains your machine, cutting out expensive call out charges and repair bills. 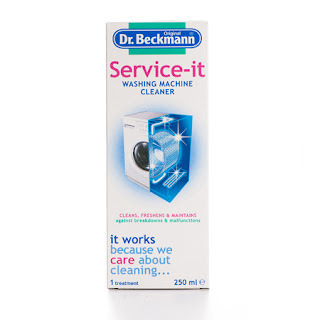 Dr. Beckmann Service-it works to eliminate detergent residues that form on the drum, pipes and seals of your machine, riding the dirt and grime that create nasty odours. Service-it also eliminates limescale on your machine’s element to improve efficiency and protect your washing machine against breakdown. It should be used once every 2 months or every 30 washes to ensure your machine is clean and continues to run smoothly and effectively. Dr Beckman has another amazing competition running from today over on their FACEBOOK page where you can win £100 in Curry’s vouchers. Get yourself on over there and enter. The prize is of a year’s worth of Dr. Beckmann Service it and Service-it Deep Clean ( 6 x Service-it and 6 x Service-it Deep Clean) They recommend people use them either alternately every 2 months or one after the other in the same month and do that every other month.